Barbara L. Fredrickson, Ph. D.
"I wish I had known years ago about... Barbara Fredrickson... In particular her theory that accumulating 'micro-moments of positivity, ' like my daily interaction with children, can, over time, result in greater overall well-being... 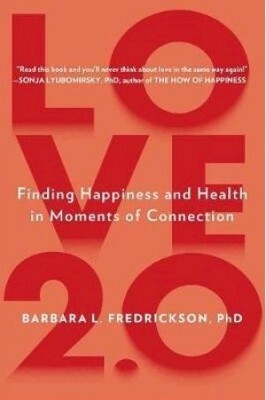 In her newest book, Love 2.0, Dr. Fredrickson reports that 'shared positivity--having two people caught up in the same emotion--may have even a greater impact on health than something positive experienced by oneself....' The research that Dr. Fredrickson and others have done demonstrates that the extent to which we can generate positive emotions from even everyday activities can determine who flourishes and who doesn't. More than a sudden bonanza of good fortune, repeated brief moments of positive feelings can provide a buffer against stress and depression and foster both physical and mental health." --Jane Brody, The New York Times We all know love matters, but in this groundbreaking book positive emotions expert Barbara Fredrickson shows us how much. Even more than happiness and optimism, love holds the key to improving our mental and physical health as well as lengthening our lives. Using research from her own lab, Fredrickson redefines love not as a stable behemoth, but as micro-moments of connection between people--even strangers. She demonstrates that our capacity for experiencing love can be measured and strengthened in ways that improve our health and longevity. Finally, she introduces us to informal and formal practices to unlock love in our lives, generate compassion, and even self-soothe. Rare in its scope and ambitious in its message, Love 2.0 will reinvent how you look at and experience our most powerful emotion.